A delegation of Tech Valley High School students and staff members stands before Beijing’s Front Gate. 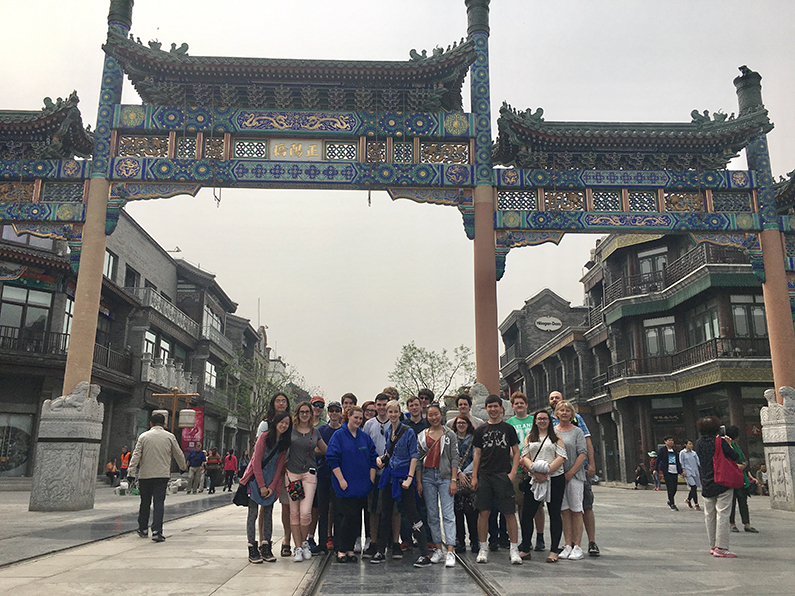 Tech Valley High School’s biennial trip to China gave a group of students and staff members the experience of a lifetime during their spring break. Nineteen students and three staff members flew to Beijing on Thursday, April 13. The trip has been highlighted by visits to sites including, but not limited to, the Great Wall, the Summer Palace, Tiananmen Square, the Forbidden City, the Terracotta Army, Huaqing Bath Pool, Dayan Pagoda and the Temple of Heaven. Students also visited Tech Valley High’s sister school in Tianjin and stayed with families of peers they hosted when a Chinese delegation visited New York in January last year. Junior Seiji Akera of Berlin said his favorite part of the trip was staying with his host family. He said he practiced traditional Chinese painting, walked beside a river at night, and made and ate good food. Junior Axton Pulliam of Berne-Knox-Westerlo said his favorite memory of the trip was playing basketball with the students in Tianjin. He said he enjoyed the cuisine and liked experiencing new things. In addition to Akera and Pulliam, students who traveled include juniors Jack O’Donnell of Guilderland, Hailey Halse of Menands, Aaron McCarthy of Shenendehowa, Thea Dimin of Averill Park, Emily Darling of Catskill, Robbie Scott of Coxsackie-Athens, Sarah Drexler of Cairo-Durham, Bennett Plowman of Brittonkill, Lynsey Handlowich of Germantown, Nick Miller, Jackson Dushane, Olivia Otero and Dan Fagan of Greenville, sophomores Purevsuren Batdorj of Rensselaer, Noah Higgins of Greenville, Caiden Larsen of Berne-Knox-Westerlo and Mark O’Donnell of Guilderland. Trip chaperones were Chinese teacher Sophia Hsia, math teacher Jason Irwin and school nurse Kim Whelan. All Tech Valley High students take at least two years of Chinese as their foreign language. TVHS’s Chinese curriculum is centered on both language development and cultural exchange. Prior to the trip, the Chinese III class project was about traveling. Hsia said the class learned about things like the importance of gifts for host families, what to wear and what cultural differences to expect.